Mexico's most popular sport is football (known as fútbol in Mexico). As of 2018[update], the top leagues are Liga MX for the men and Liga MX Femenil for the women. Football became a professional men's sport in 1943. Since then, Mexico's top men's clubs have been América with 13 championships, Guadalajara with 12, Toluca with 10 and Cruz Azul with 8. The first women's professional football league began play during the 2017–18 Liga MX Femenil season. It set new world records for attendance at a women's professional football match. Antonio Carbajal was the first player to appear in five World Cups, and Hugo Sánchez was named best CONCACAF player of the 20th century by IFFHS. Mexico's biggest stadiums are Estadio Azteca, Estadio Olímpico Universitario and Estadio Jalisco. As of 2006[update], it was estimated that there were over 324,000 registered players and 8,155,000 unregistered players in the country. Men's football has been played professionally in Mexico since the early 1900s, with the first club being C.F. Pachuca. The first women's professional football league Liga MX Femenil was announced in December 2016 and the inaugural season started the following year. The development of women's football has occurred in waves since the 1950s. Since 1996, the country has played two split seasons instead of a traditional long season: the Apertura and Clausura. This system is common throughout Latin America. There are two separate playoff and league divisions. After many years of calling the regular seasons as "Verano" (Summer) and "Invierno" (Winter); Liga MX (historically Primera División de México, Mexican First League Division) changed the names of the competition, and opted for a traditional name of Apertura and Clausura (opening and closing). The Apertura division begins in the middle of Mexico's summer and ends before the official start of winter. The Clausura division begins during the New Year, and concludes in the spring season. Mexican men's football has four divisions, beginning with Liga MX and followed by Ascenso MX, Segunda División de México, and Tercera División de México. The teams are promoted and relegated by the Mexican Football Federation (FMF). Relegation is a common practice in Mexican football. This means one club from the top league division moving down, and one side from the next level division moving up. The relegation system does not punish clubs for having a bad season. Clubs are assessed on their previous six campaigns. Points from the last six seasons are added up and divided by the number of matches played to obtain an aggregate average. The club with the lowest percentage after the Clausura season is relegated to the lower division. Mexico's most successful men's clubs have been América with 12 championships, Guadalajara with 12, Toluca 10, and Cruz Azul 8. As of May 2018[update], Guadalajara (commonly known as Chivas) and Tigres are the most successful clubs on the women's side, each winning a championship during the inaugural season of Liga MX Femenil. Both championship matches set new world records for attendance at a women's football league match with 32,466 fans in attendance at the Apertura final and 51,211 at the Closura final match. The Mexico men's national team twice finished as runners-up at the Copa América. In 1999, Mexico beat Brazil 4–3 to win the FIFA Confederations Cup. Mexico became world champions at the 2005 FIFA U-17 World Championship in Peru, and again became World Champion in other FIFA U-17 in 2011 in Mexico. Mexico have reached the quarter-finals twice at the World Cup. The most recent achievement for the team was the gold medal at the Summer Olympics in London 2012. Some players from Mexico have gone on to play in Europe, including Jared Borgetti, Rafael Márquez, Gerardo Torrado, Cuauhtémoc Blanco, Nery Castillo, Carlos Salcido, Ricardo Osorio, Pável Pardo, Andrés Guardado, Guillermo Franco, Carlos Vela, Giovani dos Santos, Omar Bravo, Aaron Galindo, Héctor Moreno, Francisco Javier Rodríguez, Francisco Fonseca, Javier Hernández (commonly referred to as "Chicharito"), Pablo Barrera, Efraín Juárez, Jesús Corona, Héctor Herrera, Miguel Layún, Raúl Jiménez, Marco Fabian and Diego Reyes the most recents. Mexico's men's national team have achieved other significant feats such as the most CONCACAF Gold Cups with 10 trophies. Mexico has hosted two FIFA World Cups, in 1970 and 1986. Estadio Azteca is the biggest stadium in the world to have hosted two World Cup finals and is one of the largest stadiums in the world. Mexico will co-host the 2026 FIFA World Cup along with Canada and United States several matches will take place in Mexico City, Monterrey and Guadalajara. The Mexico women's national football team was officially formed ahead of the 1999 FIFA Women's World Cup played in the neighboring United States. However, in 1970 an unofficial team Mexico finished third in an unofficial Women's World Cup held in Italy. In 1971, the team hosted an unofficial women's World Cup and reached the final, only to lose to Denmark 3–0. An estimated 110,000 people attended the final at Estadio Azteca. In the early 1900s, football was used as a method to "indoctrinate modern labor practices" such as teamwork and competition within a set of rules upon the unskilled workers. It is believed by some that football was introduced in Mexico by Cornish miners at the end of the 19th century. By 1902 a five-team league emerged with a strong English influence. Many of the early football teams were affiliated with corporations. ^ "Mexico Information - Page 2". World InfoZone. Retrieved 2015-02-27. ^ "Mexico City. Con Pianta - Daniel C. Schechter, Josephine Quintero - Google Books". Books.google.com. Retrieved 2014-04-01. ^ a b "Mexico - List of Champions". Rec.Sports.Soccer Statistics Foundation. Retrieved 2015-02-27. ^ "News Roundup: Union lose, Steel in, LAFC fail to impress, and USOC kicks off". The Philly Soccer Page. Retrieved 2018-05-16. ^ "For Liga MX Femenil, an impressive start to an infant league • Copa90". Copa90. Retrieved 2018-05-16. ^ "Historical Dictionary of Soccer - Tom Dunmore - Google Books". Books.google.com. Retrieved 2014-04-01. ^ MX, LIGA MX / ASCENSO. "LIGA MX - Página Oficial de la Liga del Fútbol Profesional en México . : Bienvenido". www.ligamx.net (in Spanish). Retrieved 2018-05-16. ^ FIFA.com (1900-01-01). "New horizons in the development of Mexican football". FIFA.com. Retrieved 2018-05-16. ^ a b L’Hoeste, H. Fernández; Irwin, R.; Poblete, J. (2015-05-06). Sports and Nationalism in Latin / o America. Springer. ISBN 9781137518002. ^ Fellerath, David. "A thought experiment: What would NASL's split-season plan look like this season?". Indy Week. Retrieved 2018-05-16. ^ "Chivas wins inaugural Liga MX Femenil title". ESPN.com. Retrieved 2018-05-16. ^ "Femenil final shows women's football is thriving in Mexico". ESPN.com. Retrieved 2018-05-16. ^ Kessel, Anna (2015-06-04). "Women's World Cup: from unofficial tournaments to record-breaking event | Anna Kessel". the Guardian. Retrieved 2018-05-16. ^ "Mundial (Women) 1971". www.rsssf.com. Retrieved 2018-05-16. ^ a b "Mexico: An Encyclopedia of Contemporary Culture and History - Don M. Coerver, Suzanne B. Pasztor, Robert Buffington - Google Books". Books.google.com. Retrieved 2014-04-01. ^ "Introduction". 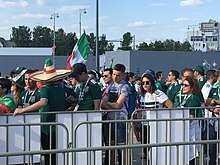 Federacion Mexicana de Futbol. Retrieved 2015-02-27. ^ "Mexico - List of Final Tables". Rec.Sports.Soccer Statistics Foundation. Archived from the original on 2015-04-02. Retrieved 2015-02-27. ^ "Culture and Customs of Mexico - Peter Standish, Steven M. Bell - Google Books". Books.google.com. Retrieved 2014-04-01.